The iMac has come a long way from the consumer machine designed to be simple to setup and get you quickly on the internet. It was the worlds first legacy free PC, popularised USB and began the demise of floppy disks. The first iMac was released way back in 1998 and has gone through several complete redesigns. It started with the iconic iMac G3 in a range of bright colours including the popular Bondi Blue model and included all the components tucked behind a CRT monitor. It also came with the what has been described as the worst mouse of all time, the hockey puck. It was followed by the all white iMac G4 in 2002 with all the components crammed into the spherical base and an LCD display floating on a flexible arm. 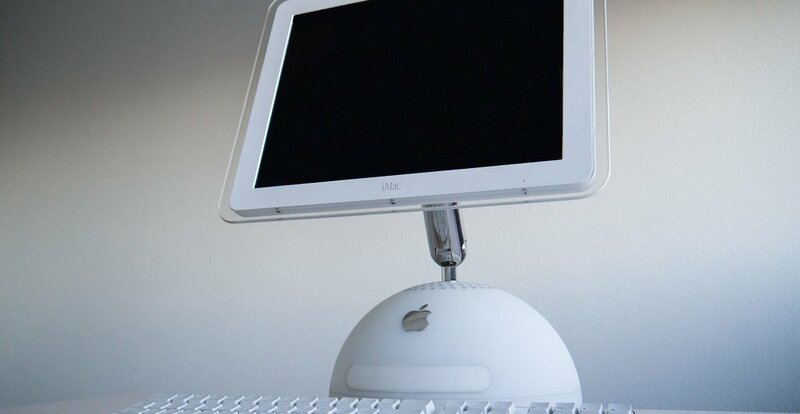 The iMac G5 followed in 2004 and resembled an all white, plastic and bulkier version of the iMac we know today. It was followed by an Intel version in the same white plastic body in 2006. The slimmer anodized aluminium version came in mid 2007 and was still focused on consumers although it was becoming widely used in creative businesses. The 27" model came in 2010, has had a few upgrades over the years and became the go to desktop machine for creative professionals. Enter the most powerful iMac ever! The latest iMac in a beautiful space grey aluminium with matching pro accessories is the most powerful Mac ever. It is no longer the consumer iMac of the past and cements the iMacs place as a high performing desktop for creative professionals. The "basic" model has a 2.3 GHz 8-Core Intel Xeon W processor - Turbo Boost up to 4.2GHz, 32GB of 2666MHz ECC memory, 1TB of SSD storage, Radeon Pro Vega 56, 10Gb Ethernet, four Thunderbolt 3 ports and an amazing 27-inch 5120-by-2880 P3 Retina 5K display. It can support up to 18 processor cores, 128GB of memory, 4TB SSD and 8 core VEGA 64bit graphics and blows away the performance of it's older Mac Pro sibling. It comes with a powerful price tag too! This new professional workstation starts at $7,299 with custom options taking the machine over $20,000. If you can afford the price tag then this machine will provide the perform creative professionals need for years to come. What do I buy for Christmas? Did Apple slow my iPhone with the latest update?